Transitioning to the clean life can be overwhelming. There’s so much to know and do so instead of taking tons of time Googling all sorts of things on the internet or buying another book, I put together a resource section for you. 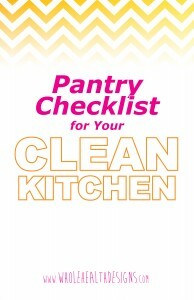 Check out these free and valuable goodies and get started on kickin’ it clean right away. 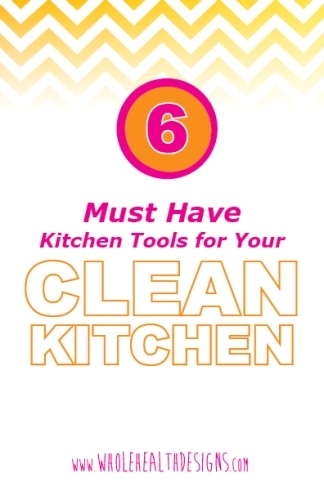 I made a resource guide with the top 6 must-have kitchen items, where to get them, how to get discounts, and what brands to buy. It’s pretty detailed…a lot to tell you! I want to make sure you got all the right info to gather up your gear. Read more and watch my tutorial video. I developed a print-and-go pantry list for you. Bring it with you the next time you shop. 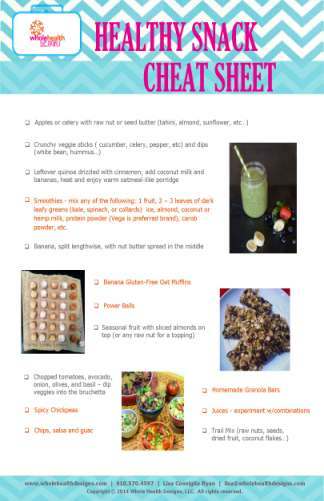 I listed the produce, snacks, canned and frozen goods (yep, there are a few I recommend), proteins, oils, and more. As you ease into the clean life, detox, or simply experiment with what works best for YOUR body, use this simple list as a guideline. You won’t find foods like mac and cheese or sticks of butter on the list like others out there…this is a clean, healthy list focusing on plant-based and gluten-free items that feed your soul and allow for more hotness. Read more, take a look at my pantry and the products I use, and get step-by-step directions on how to build a healthy pantry. 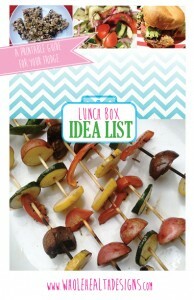 Have a habit of forgetting to eat lunch? Use this handy chart to make well-balanced lunches to keep you fueled throughout your day. This chart can be posted on your fridge so you can make delicious and clean lunches in a snap. Read more and get my instructions on how to build a meal with a healthy carb, protein and fat. Read more and get my instructions on how to build a meal with a healthy carb, protein and fat. Eating every 3 hours keeps your metabolism boosted, blood sugar level stable, and helps you focus and feel energized throughout your day. Healthy Carb (fruit or veggie) + Healthy Protein (nuts, seeds, quinoa…) + Healthy Fat (avocado, coconut…) = A damn AWESOME snack! White processed refined sugar has always been a nutritional “stay the hell away” ingredient. It spikes your blood sugar, increases inflammation, and sends you on an endless roller coaster of cravings. And artificial substitutes like Splenda and Sweet ‘N Low come with chemical toxins that you need to avoid altogether. In fact, I have no tolerance for the artificial AND white sugar. 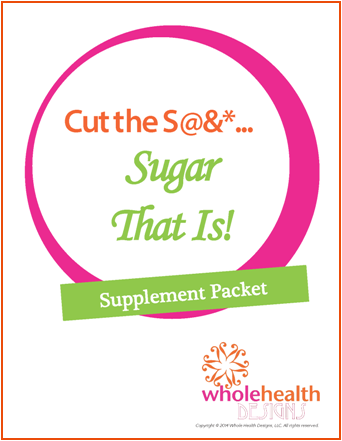 There are no nutritional benefits to consuming sugar. I mean NONE. But without a little sweetness, life can be boring and bland. I have a gazillion recipes here on the site so here’s the link for all kinds of goodness: https://wholehealthdesigns.com/category/blog/recipes/. Blend ingredients and drink up! Add 1 Tbsp. ground flaxseeds for omega 3 boost. Add 1 Tbsp. raw almond butter for protein boost. Replace water with 1 1/2 cups unsweetened original almond milk. Blend ingredients and drink up. Juice up all ingredients. Drink up! Preheat oven to 350° F. Combine all ingredients in a small bowl, and toss until well coated. Place on parchment-lined baking sheet, and bake for 10 minutes, or until toasted, stirring occasionally. Let cool. Whisk together all ingredients and season with salt and pepper. Place spinach, pear, and cranberries in a bowl. Add vinaigrette and toss. Transfer to serving bowl and top with pecans. Serve. Heat oil in medium-sized pan over medium-high heat. Add beans, tomatoes, onions and cook for 2-3 minutes. Add collards and cook for another 2 minutes. Remove from heat and add mixture to bowl. Stir in vinegar, juice, and oregano and mix well. Season with salt and pepper. Serve warm. Heat oil in a large pot over medium heat. Add onion, garlic, cilantro, cumin, chili powder, and flakes. Cook for 5 minutes. Add potatoes and stock cook until boiling. Lower heat and cook for 20 minutes. Puree 3/4 of the soup. Pour back into the pot and stir. Season with salt and pepper. Serve. Mix almond butter and honey together. Blend oats until powdered. Add oats to nut butter/honey mixture. Adjust consistency if necessary. Roll balls in coconut or seeds. Makes 35-40 balls. You can add cacao nibs, gogi berries…my go to sweet addition is the raisin. Preheat oven to 350˚F. Mix all ingredients in a bowl. Pour the mixture into a muffin pan. Bake for 20-25 minutes or until slightly brown at the top. In a large bowl, mix oats, hemp, seeds, raisins, and nibs. In a separate bowl, whisk together nut butter and syrup. Pour the mixture into bowl with dry ingredients. Mix well until everything is sticky. If too dry, add more nut butter. Press mixture into a shallow 8×12 baking dish. Make sure to line and cover dish with foil or wrap. Place in fridge for 3 hours. Cut into bar shapes, wrap, and keep refrigerated until ready to eat. Makes approximately 12 bars (depends on how big you slice~ I like them huge!). Note: There is approximately 8-10 grams of protein for each Yay Bar. Soak dates in water for 5 minutes. Meanwhile, blend nuts, cinnamon, and coconut together. Add in the dates and blend thoroughly. The mixture will become sticky. Press into a 8×8 square pie dish and put aside. Sliced strawberries and blueberries to make the flag. Drain cashews and add them to the blender with the rest of the ingredients. Pulse until everything is smoothly pureed. Then pour into the pie crust. Spread it evenly, making a nice swirl with the spatula. Bake for 40 minutes at 250 degrees F. Remove from oven and let cool. Add blueberries and sliced strawberries to make the flag.